Gizmodo has received a letter from Apple's senior vice president and general counsel Bruce Sewell formally requesting the return of "a device that belongs to Apple." 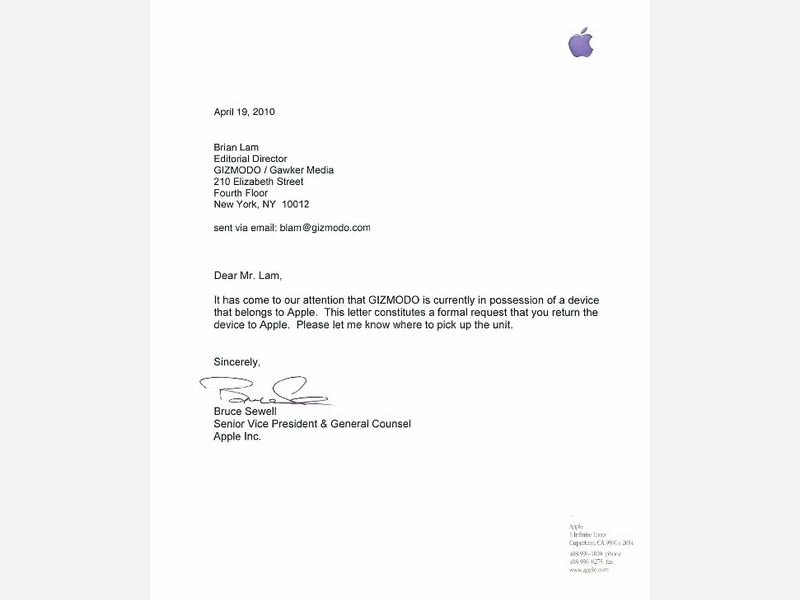 Gizmodo's Jason Chen published the letter (shown below) with a response to Apple that insisted "we didn't know [the prototype iPhone] was stolen" at the time that Gizmodo chose to shell out a reported $5,000 to obtain it from the person who claimed to have found it. It is beyond dubious that Gizmodo would have paid that much money for a device if it did not reasonably think that it was anything other than a real prototype that belonged to Apple. Further, the fact that it was remotely wiped provided compelling evidence that it was in fact stolen. However, in addition to the legal issues involved with buying stolen merchandise (which are in effect regardless of whether the buyer knows the goods are stolen or not), Gizmodo also faces legal consequences under California's Uniform Trade Secrets Act. Section 3425.1 defines "misappropriation of trade secrets" as a civil code violation, with wording that makes it pretty clear that buying a stolen prototype, determining it is authentic and includes valuable information in the form of trade secrets, and then publishing the information to earn money and notoriety for doing so is something that will expose you to legal liability. (a) Improper means includes theft, bribery, misrepresentation, breach or inducement of a breach of a duty to maintain secrecy, or espionage through electronic or other means. Reverse engineering or independent derivation alone shall not be considered improper means. (b) Misappropriation means:(1) Acquisition of a secret of another by a person who knows or has reason to know that the secret was acquired by improper means; or (2) Disclosure or use of a secret of another without express or implied consent by a person who:(A) Used improper means to acquire knowledge of the secret; or (B) At the time of disclosure or use, knew or had reason to know that his or her knowledge of the secret was: (i) Derived from or through a person who had utilized improper means to acquire it; (ii) Acquired under circumstances giving rise to a duty to maintain its secrecy or limit its use; or (iii) Derived from or through a person who owed a duty to the person seeking relief to maintain its secrecy or limit its use; or (C) Before a material change of his or her position, knew or had reason to know that it was a secret and that knowledge of it had been acquired by accident or mistake. (c) Person means a natural person, corporation, business trust, estate, trust, partnership, limited liability company, association, joint venture, government, governmental subdivision or agency, or any other legal or commercial entity. (d) Trade secret means information, including a formula, pattern, compilation, program, device, method, technique, or process, that:(1) Derives independent economic value, actual or potential, from not being generally known to the public or to other persons who can obtain economic value from its disclosure or use; and (2) Is the subject of efforts that are reasonable under the circumstances to maintain its secrecy. § 3426.3 (a) A complainant may recover damages for the actual loss caused by misappropriation. A complainant also may recover for the unjust enrichment caused by misappropriation that is not taken into account in computing damages for actual loss. (b) If neither damages nor unjust enrichment caused by misappropriation are provable, the court may order payment of a reasonable royalty for no longer than the period of time the use could have been prohibited. (c) If willful and malicious misappropriation exists, the court may award exemplary damages in an amount not exceeding twice any award made under subdivision (a) or (b). A following section indicates Apple has three years to file suit against Gizmodo and or Gawker Media. § 3426.6. An action for misappropriation must be brought within three years after the misappropriation is discovered or by the exercise of reasonable diligence should have been discovered. For the purposes of this section, a continuing misappropriation constitutes a single claim.